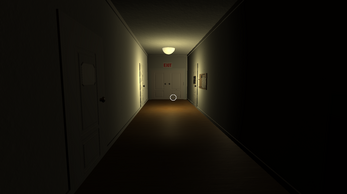 I WAS HERE is a game I made for my capstone project in order to earn my BFA in Game Design from the NYU Game Center at New York University's Tisch School of the Arts. 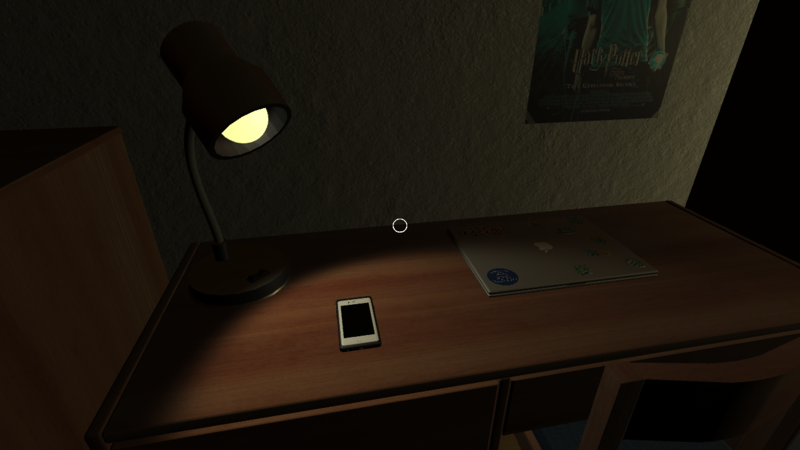 I WAS HERE is a first-person narrative game where players get a voyeuristic and intimate look into the lives of others. The player finds themselves in the consciousness of Skye Lockwood, a woman taking a retrospective look into her memories of her high school relationship with her roommate at their all-girls boarding school Greybrook Academy. 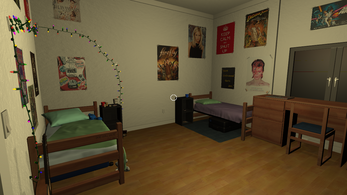 Players walk through Skye's dorm room and interact with the various objects scattered around the room. Doing so, they recover short audio scenes depicting memories attached to Skye and her girlfriend Olivia's possessions in the room. I want to invite the player to think about missed opportunity, regrets, closure, acceptance, and letting go. Players will see how Skye and Olivia had a beautiful but short-lived relationship as Skye's inevitable graduation draws nearer and nearer. Throughout the game, the tension builds as Skye and Olivia fall in love and try to determine the fate of their relationship. They will inevitably go their separate ways at the end of the year when Skye graduates and Olivia is left to complete two more years of high school. The game's ending is characterized by a somber emptiness as the girls distance themselves from each other and Skye realizes that if she truly loves Olivia, she must let her go. By the end, the audience realizes that they are Skye, now in a place of retrospection and reflection on this era of her life. Skye realizes that though she loved and lost and never fully realized the potential of her relationship with Olivia she must now come to terms with and accept that fact. I want the player to leave with the feeling that what Skye had with Olivia was real and good despite its short life and somber ending. I gave your wonderful game a go, and enjoyed the hell out of it. also amazing music by you!! i really like your game. I really enjoyed the wonderful game! Although it wasn't as long as I'd hoped, I loved the relationship between the girls and the ending really got to me. Hope you continue to make great games like this! Really enjoyed the game, I have a video recorded for my YouTube channel. Currently editing it. I have viewers that want subtitles for videos so i'm having to add in subtitles as I couldn't find an option for it so I hope i'm adding them in for the correct people. I really loved the game though, made me kind of sad at the end. The song choice was good, I Miss You by Blink 182. Loved every moment about it. Thank you!! Send me the link to the video, I'd love to see it! I enjoyed this short but also awesome creation you called I Was Here! So much..that i made a video an posted it to my channel. I hope that you and the rest of the itch.io gamers will enjoy the gameplay! Thanks for sharing your art with us! I dove into this adventure not knowing what to expect, hell I didn't even read the description. But I didn't need to, as the story unfolded so does your connections towards the characters. Definitely worth playing. This was so cool to play and really kinda hit home. I didn't expect it to be so eye opening. You did such a wonderful job! Short but sweet <3 I really wish there was more but that was great!! Thank you so much!! Yes, please post it, I’d love to watch it and see what you think. It really means a lot to hear that my story was able to make you feel for the characters!! Downloaded this game because I love walking simulators and blink-182. The minute I saw the David Bowie poster in one of the screenshots I was sold(I'm a HUGE Bowie fan), can't wait to play!! Really amazing game. Truly moving message and loved the voice acting/narration. I really felt for these two people I had never met before. I think we've all been separated from someone like whether it was a friend or a significant other which makes this game so emotional. Thank you for making a great game. Thank you SO MUCH!! I loved your video, and it means the world to me that you felt for my characters and really cared about the story I made. Thank you so much. pretty cool game really like the story the graphics cant wait to see more games for you!! Thank you so much!! That means so much to me. Thanks for making a video too! I've always liked playing these narrative experience type games. The main point in these is the story that the developer is trying to portray. Its not about the crazy gameplay or insane graphics. 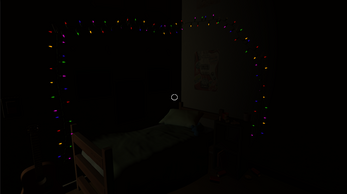 But an emotional experience that, in my opinion, leaves you feeling a little like your in game character in the end. 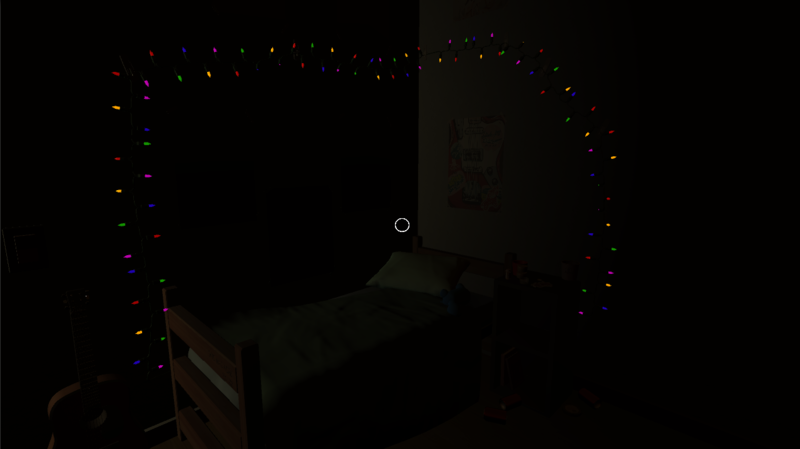 I got a "Gone Home" vibe while playing this. Even though this game isn't nearly as big, it takes the stance of creating emotional connections with objects and telling the story behind them. Not only was the story quick and well written, but it nice voice acting to take you through the story. 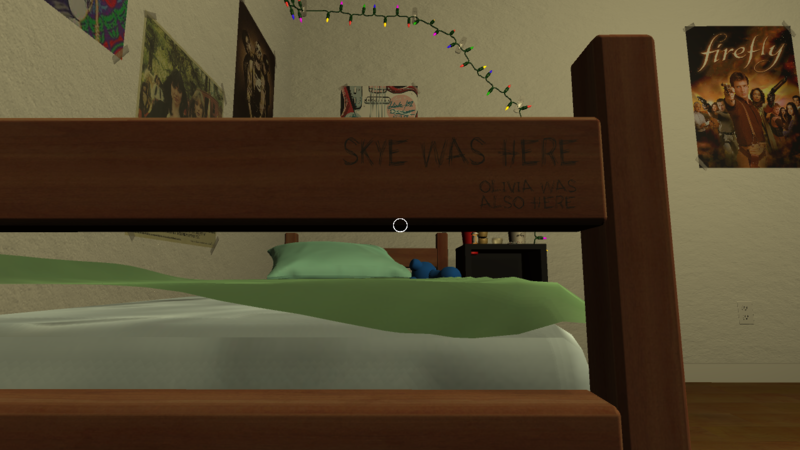 This story is all about the friendship that Skye and Olivia, and the voice actresses do a good job at expressing that friendship through their dialogue. All in all a nice little story with a short and well written story and I hope to possibly see more from this developer again. I did a video on my experience with the game if anyone is interested. Thank you!!! Great video! Yes, Gone Home was a big inspiration for this project! Thanks for your feedback, it really means a lot to me! Thank you so much! I'm really glad you liked it. Love your video!